Heat 1 tablespoons butter in heavy large saucepan over medium heat. Add shallots and garlic. Cook on medium flame until shallots and garlic but not browned. Add the chopped cauliflower and chicken stock. Bring to boil. Reduce heat to low, partially cover, and simmer gently until cauliflower is tender (about 10 minutes). Puree the soup in small batches in blender until smooth. Pass the soup through a sieve. Return to same saucepan. Season soup with kosher salt and white pepper. Add the cream (more or less in quantity to your taste and diet. 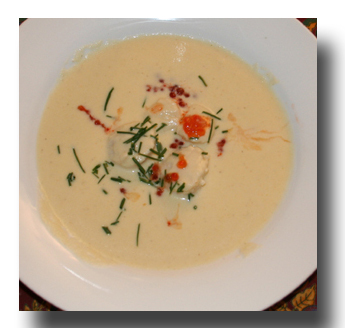 This soup can be made a day ahead (Note: Add the cream before serving). Season the leeks with salt and pepper then sweat the leeks in 1 tablespoon of butter. Clean and dry very well the scallops. Season scallops right before cooking. Sear the scallops in olive oil. Place a dollop of leeks in each plate. Top with a seared scallop. Place soup around leeks. Garnish with salmon roe and chives. At the table drizzle some extra virgin olive oil (and a few drops of fresh squeezed lemon juice) over the soup... see image below. Heat 1 tablespoons oil in heavy large saucepan over medium heat. Add shallots and garlic. Cook on medium flame until leeks and shallots are is soft, about 5 minutes. Add the chopped cauliflower, chicken stock. Bring soup to boil. Reduce heat to low, partially cover, and simmer gently until cauliflower is tender (about 10 minutes). Puree the soup in small batches in blender until smooth. Pass the soup through a sieve. Return to same saucepan. Season soup with kosher salt and white pepper. Add the cream (more or less in quantity to your taste and diet. This soup can be made a day ahead. Add the cream before serving. Sweat the leeks in a small pot with using butter or olive oil. Clean the scallops. Bring the soup back to a boil then add the scallops and turn off the flame. 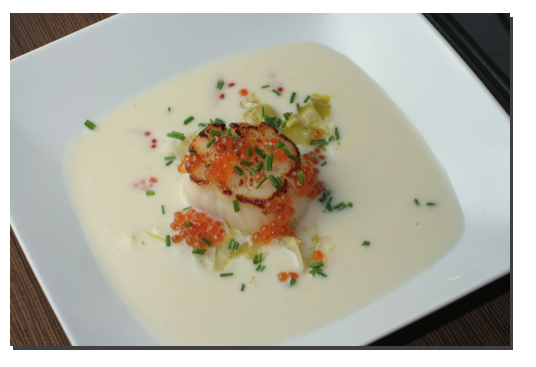 Let the scallops poach in the soup till cooked to your taste. If the scallops are very fresh they can be sliced add to the bowl and then let the soup cook the scallops in the bowl. Set a spoonful of leeks in the center of a plate. Place two poached scallops on top. Surround with soup. Garnish with Salmon Roe and Chives. Drizzle a delicate extra virgin olive oil over the soup.